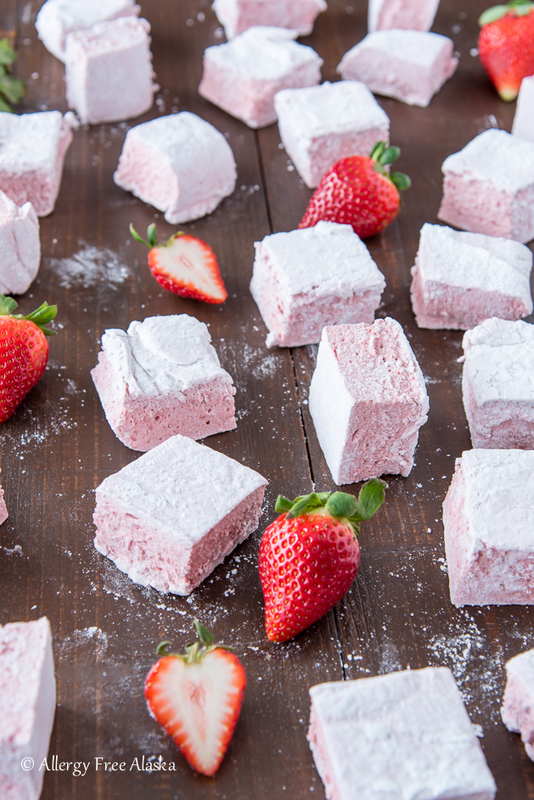 Boost your s’mores up a notch with these luscious Real Food Strawberry Marshmallows (Corn Syrup-Free). These babies are fluffy and light, yet have a delicious and distinctive strawberry flavor. Hi everyone! Sorry I’ve been few and far between these days; I ended up going back to work. It wasn’t something I planned on doing, but a part-time job offer just fell in my lap. The money and ability to work from home was too great to pass up, so I had to go for it. Life has been a little chaotic (as you can imagine), trying to settle into a new routine while juggling homeschool, work, website, and day-to-day stuff in general. Hopefully balance will come with time. They are an incredible group of good people, some of our country’s best, for sure. 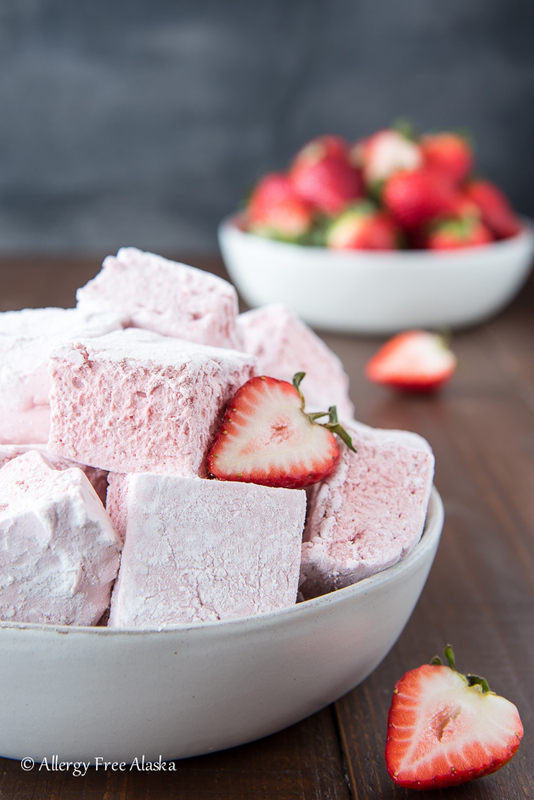 Unlike the store-bought artificially flavored strawberry marshmallows, these Real Food Strawberry Marshmallows are made with all real food ingredients – no dyes, corn syrup, or artificial colors or flavors. I use real strawberries for flavoring, and beet powder to achieve the pretty light pink color (the beet powder is completely optional, but it certainly adds to the visual appeal, especially the visual appeal of little girls)! 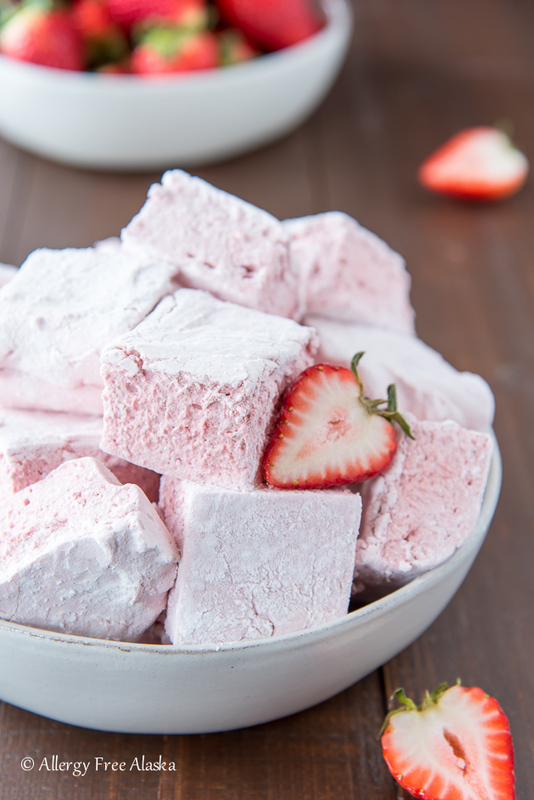 The strawberry flavor of these marshmallows is subtle, not overpowering, and just like you would expect a marshmallow to be – they are fluffy, chewy, and sweet! Make the strawberry puree by blending fresh strawberries (or frozen strawberries that are mostly thawed) in a blender until smooth. Test the temperature of your puree with your finger. If it is not cold, refrigerate until chilled. (Recipe tip: I make my puree, measure out 3/4 cup, and freeze the remaining to use at a later time.) 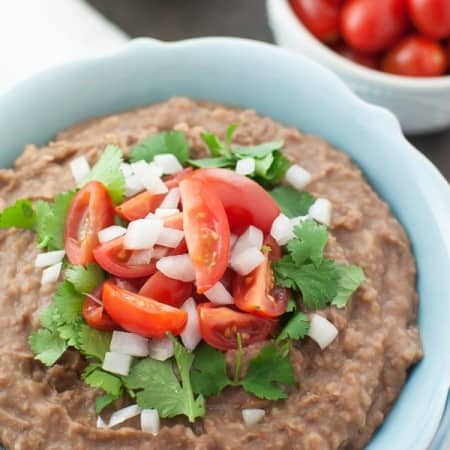 Place the puree in the bowl of an electric mixer. Sprinkle the gelatin on top of the strawberry puree and use the mixers whisk attachment to whisk until combined. Set aside so the gelatin can soften for at least 10 minutes. Line a 9” x 13” baking pan with parchment paper and lightly grease. Generously dust all sides and the bottom of the pan with 1/4 cup arrowroot starch. In a medium-sized saucepan over medium heat, combine the organic cane sugar, pure maple syrup, and cold water. Bring to a boil and then reduce heat to medium. Use a candy thermometer and bring the mixture up to a temperature of 245 degrees (F), stirring occasionally. This should take 8-10 minutes. Remove from heat, and carefully pour the syrup mixture down the sides of the mixer bowl while mixing on low (it’s hot, so please be careful!). Gradually increase speed to high and whisk for 13-15 minutes, or until the marshmallow mixture is glossy, light and fluffy, and nearly triple in volume. Immediately place the marshmallow mixture in the parchment-lined baking pan and use a greased spatula to spread it out evenly. Dust the top of the marshmallows with 1-2 tablespoons of arrowroot starch and let the mixture set for 4-8 hours, or overnight. Turn the marshmallows out onto a large cutting board, and use a pizza cutter to cut the marshmallows into 1-2 inch pieces. Roll the sticky edges of the marshmallows in additional arrowroot starch, and store in an airtight container in the refrigerator (remember these contain strawberries, have no preservatives, and will spoil if left out at room temperature). Consume within 3 days. *Beet powder is completely optional, as it does not add to the flavor or sweetness of this recipe. I only add it to deepen the pretty pink color of the marshmallows. I’ve made homemade marshmallows before, but never with a tint! Yours are so lovely! I honestly don’t know. Some articles say you can substitute vegan subs like agar agar as a 1:1 ratio with gelatin, but I haven’t tried it in this recipe to give you a clear answer if it will work or not. You might need to do some experimenting! Here’s an article you might find helpful. I’m really excited to tried these, thank you for posting the recipe! I was wondering, I don’t have a mixer bowl or electric whisk, would a food processer be sufficient enough? How important is it to get the sugar mixture up to 245 degree? 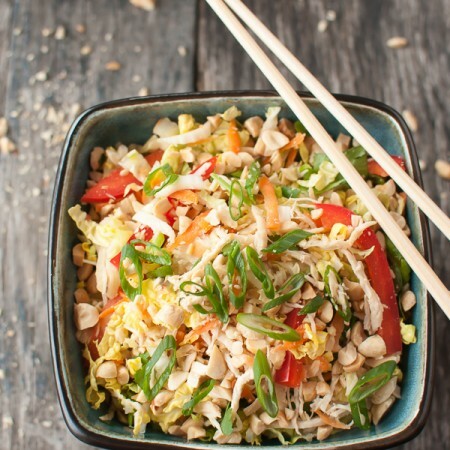 Will it affect the recipe if it doesn’t? Thanks! These are awesome! I linked this recipe to my friend on facebook after you put it up this week and she made them for me! We all need more friends like that. I am not a fan of marshmallows but you can taste the berries in these and there is just a hint of tart to offset the sweet. you were right—I could not stop eating them. I am sure that I could be in sugar shock after this but boy, what a way to go. You are very blessed with a wonderful friend! 😉 I’m so happy you enjoyed them! Thanks for taking the time and commenting. My family is intolerant to the fruit and sugar combo (we usually eat honey, maple, or coconut palm sugar). 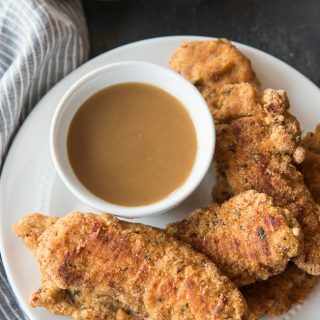 Can I sub the sugar in this recipe? Thanks! You sure can. Coconut sugar would change the marshmallows to more of a caramel flavor, but as long as you don’t mind that, you’re set!